Sara: Here is our next house. The fence adds a nice, rustic, touch. 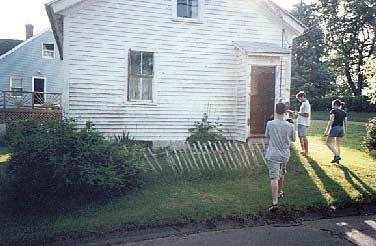 Chris: There was nothing really wrong with the exterior of this house, besides the weather-worn fence. Houses that are supposedly abandoned shouldn't have newspapers dated July 7th, 2000 in their mail slots, however, since our voyage was on or near July 7th, 2000. Casey: There was a guy doing yardwork all day in the house next door. I thought he would get all upset about us snooping... uh.. investigating... around, but he didn't care at all. Note my position, just in case he does decide to care.